Lookfantastic Beauty Box November - what's inside? Lookfantastic’s new beauty box is here! I just received it and I thought it would be fun to unbox it together. I’ve actually never tried lookfantastic’s beauty boxes before, so it’s also the very first box for me. Actually I haven’t tried that many beauty boxes anyway. But since lookfantastic* is one of my favorite stores, I was eager to see how their boxes are. Based on this box, I’m pretty impressed. And excited! Receiving a surprise beauty box is thrilling. And nice. I think I’m starting to get the whole beauty box thing now. 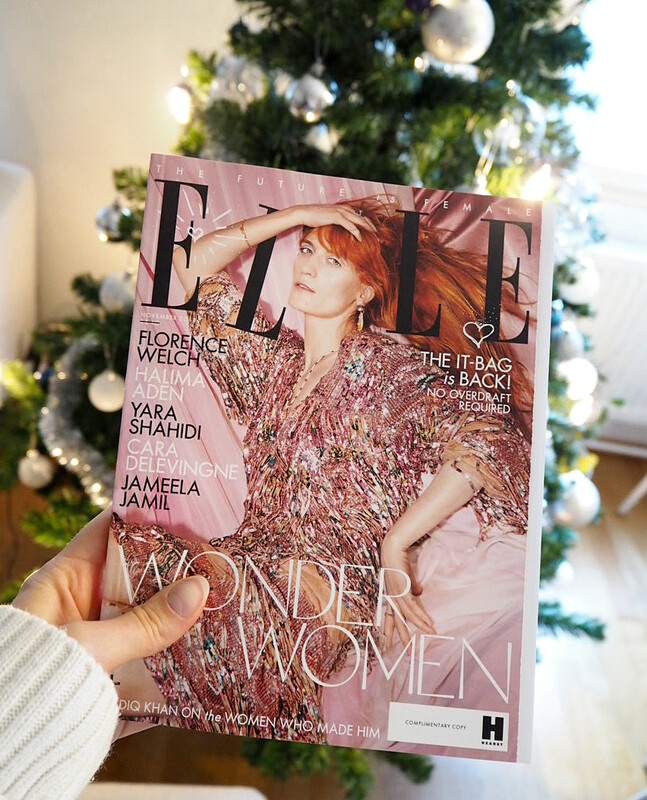 Lookfantastic November Beauty Box – what’s inside? The theme of this month was ‘Dark Wonder edition’. How suitable – talk about darkness in November. It’s been pitch black in Helsinki and I’m still getting sleepy at 3 pm. But enough about complaining about the inevitable (=winter in Finland). Ah, yes! I love reading women’s magazines in English. This alone was the nicest surprise! This bath bomb smells delicious even through the packaging. Too bad I don’t have a bath tub. But – next time we’re at a hotel or at an airbnb, I’m taking this with me. Because we always choose a room or an apartment with a bath tub. I’ve tried a face cream from REN before and I loved it. It felt like a really good quality product. So I’m very happy with this. A calming cream sounds perfect right now, since the cold is starting to affect my skin. What I like about REN is that they mostly use natural ingredients and they don’t use ingredients that can possibly irritate skin or clog pores, like silicons, mineral oils or synthetic fragrances. I’m all about chemical exfoliants and I’m serious about exfoliating my skin weekly. And I love gentle products. Papaya enzyme is a good gentle exfoliant and I’ve tried products containing it before. So this should be good. 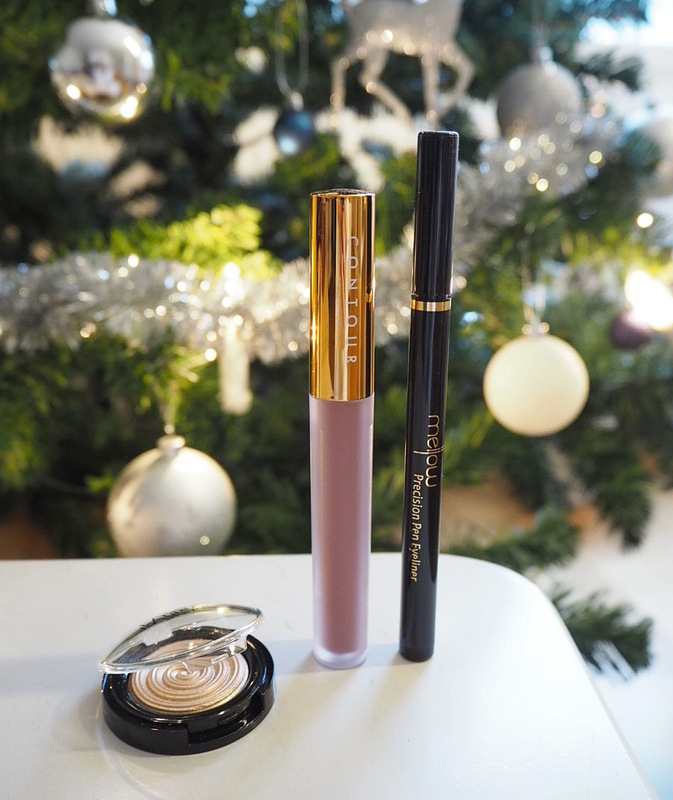 A beautiful gold highlighter that feels smooth on the skin. It’s quite pigmented and gold, so I think I will prefer using this as an eyeshadow. This is my favorite makeup product from this box. I’ve never heard of this brand, so it’s nice to try something completely new. I love the packaging! This lipstick is matte and supposed to be kiss-proof and last all day. Nowadays I’m not a huge fan of matte products, but we’ll see if I like this. A classic black eyeliner with a pen-like tip. The color was really black and intense, which I like. And the packaging is nice. Swatches of the Contour cosmetics lipstick in shade Juju, mellow Precision Pen Eyeliner and Laura Geller Baked Gelato Swirl Illuminator in Gilded Honey. 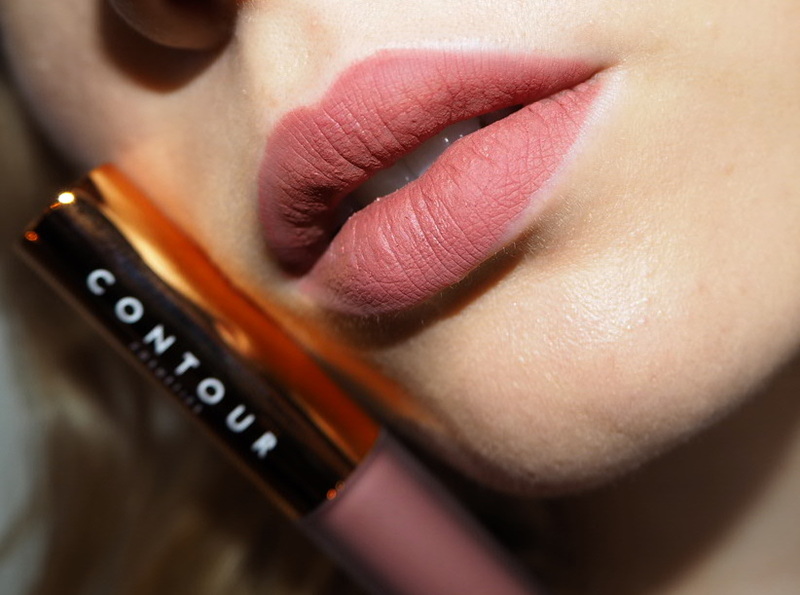 CONTOUR cosmetics lipstick in Juju on the lips. That’s it for November’s box. What do you think of the contents? One box costs 19$ and if you subscribe, it’s cheaper. For example 3 month subscription is 18$ per box and 12 month subscription is 16$. Already in this box you got your money’s worth, since the lipstick alone costs over 20 $. Order your Lookfantastic Beauty Box here*.